VANCOUVER — Friday night football is back. 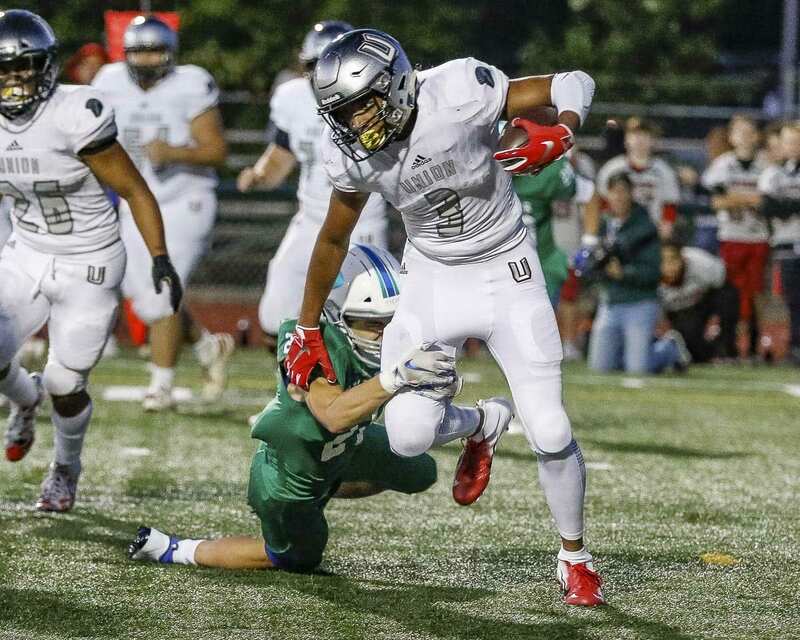 The Union Titans, ranked by some as the top team in the state in Class 4A, held off 3A Mountain View 17-14 late Friday night at McKenzie Stadium in a game featuring defending league champions. 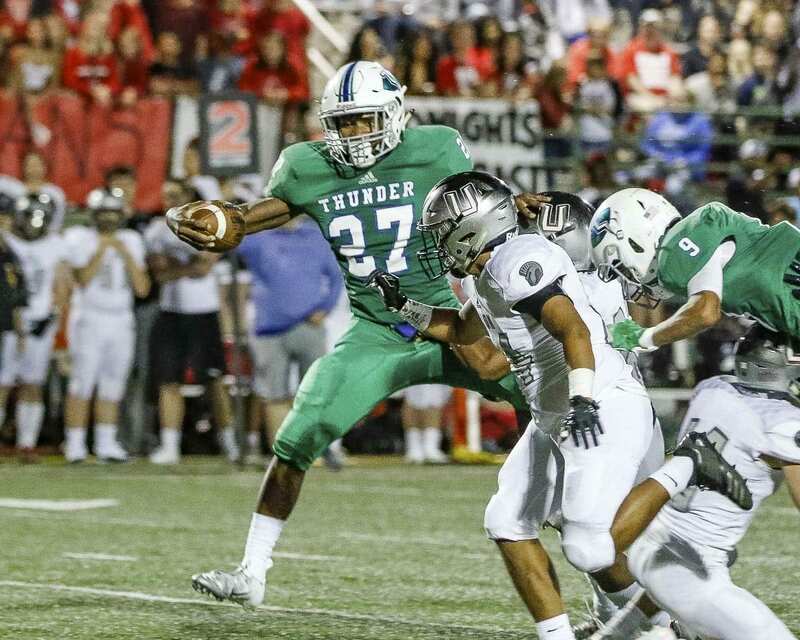 Christian Alcorn connected on a 23-yard field goal with 2:34 left in the game and Alex Vallejo recovered a Mountain View fumble after the Thunder had reached the red zone, securing the victory. Jojo Siofele, who only had one first-half carry, finished with 110 yards rushing. He set up Union’s second touchdown with a 30-yard run to the 3-yard line. Then he finished off the Thunder with two first-down runs in the final 90 seconds after Vallejo recovered the fumble. “We brought it that second half to get the win,” said Siofele, who also had an interception on defense. Still, when all was said and done, it was the Titans who did just a little bit better job. 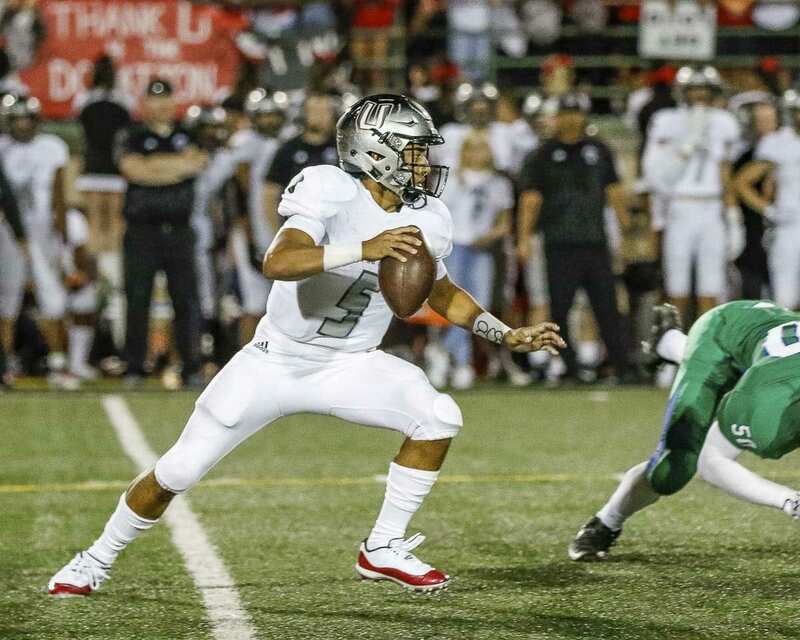 Both teams, known for their offenses, struggled to score against two sound defensive squads. While the defenses were on point for most of the night, both offenses got going in the fourth quarter. Mountain View tied the game on Phillip Earnhardt’s 4-yard run with 6:44 to play, capping an 11-play, 60-yard drive. The Titans responded by traveling 66 yards on eight plays. Siofele had a 20-yard run and Victor followed later with a 27-yard run. The drive stalled, but plenty close enough for the Titans to call on Alcorn. “I was pretty nervous. The heart was pumping,” Alcorn acknowledged. “He couldn’t even breathe,” Rosenbach joked. Alcorn, though, remembered his training, got his focus, and had to trust his game. The kick was not perfect — a low, liner in fact — but it went through the uprights. “Holy crap. I can’t believe I got that,” he said. He did, and those points were the difference. It was not over, though. The Thunder got it going on offense again, with three consecutive first downs to reach the Union 9-yard line inside the final two minutes. Mountain View turned it over on the next play. The Thunder, in fact, will be sick about all the penalties they had. On one drive, they had a first down on the Union 18-yard line. Four penalties later, the Thunder faced a second-and-52 from their own 40-yard line. Still, Mathieson was proud of the effort against one of the top teams in the state. His players, disappointed in defeat, are already focused on the rest of the season. “This gives us a lot of confidence going forward,” said Makai Anderson, who had six catches for 49 yards. Union responded a little more than a minute later when Nile Jones scored on a 5-yard run after Victor broke free for a 47-yard run. 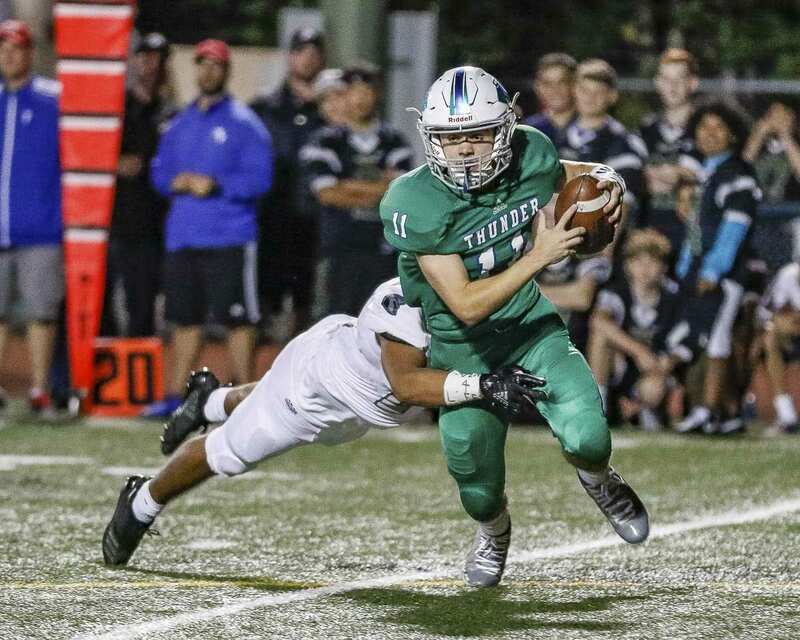 Defenses ruled the second quarter, setting up a wild second half to complete the first Friday of the season. RUSHING: Union — Jones 16-45, Victor 12-85, Siofele 11-110, Darien Chase 1-(minus 2), Team 2-(minus 4). Mountain View — Mertens 19-96, Tresean Foreman 8-69, Garrett Moen 7-(minus 5), Andrew Gulliford 1-1, Earnhardt 3-0. PASSING: Union — VIctor 5-9-1-60. Mountain View — Moen 14-22-1-138. RECEIVING: Union — Chase 2-18, Alex Vallejo 1-11, Siofele 2-31. Mountain View — Jordan Cook 1-1, Earnhardt 3-35, Michael Bolds 3-46, Makai Anderson 6-49, Mertens 1-7.